No workshops listed? Check back frequently for new dates / Sign up for our newsletter to get first dibs on registration / Explore other options, from private instruction to group workshops. We offer concise yet comprehensive introductory workshops on weekday evenings and weekends. From time to time we will offer intermediate and special topic workshops. Learn the basics of one-colour printing on paper and fabric: How screens work; the photo emulsion process; basics of designing artwork; differences in inks, printing substrates, screen mesh and film work; terminology; one-colour printing techniques; learn how to set up a printing area for one-colour printing, adaptable to a home or studio setting in a small or large space. Use your own artwork to print or select from our stock images. Take away small art prints on paper or fabric you've brought with you. > Check out our ideas for stuff you can make. Pricing: $145 + HST, 4-hour session, all materials included. Learn intermediate techniques through multiple colour printing on paper: Intermediate methods for designing layered artwork; ink mixing and expanding colour range; reclaiming your screen; the registration system; multiple colour effects through two-colour printing techniques; and approximately 4 hours of studio time to print and experiment; learn how to set up a printing area for multiple-colour printing, adaptable to a home or studio setting in a small or large space. Use your own artwork to print or select from our stock images. Take away small art prints on paper or fabric you've brought with you. Note: This workshop will focus on printing on paper, although these techniques can be applied to fabric and other mediums. Pricing: $215 + HST, two x 4-hour sessions = 8 hours total, all materials included. Participants must have completed Silkscreening 101 as a prerequisite. Up your game: Explore and experiment with specific elements of silkscreening not covered in the 101 or 201 workshops. Topics covered could include silkscreening and artist books; art and activism; experimental silkscreening; summer bootcamp; stencil silkscreening; print as collaborative performance; monoprints; Photoshop for silkscreening beginners; DIY publishing; and silkscreening for special occassion workshops. Pricing and dates coming soon. All levels welcome: Ideal for beginners and intermediate printmakers and creatives who would like to add a new skill to their current skill set. Use your own artwork and items to print on: Customize your silkscreening workshop experience by printing your own artwork. Or if you’re short on time, select from our stock images. Feel free to also bring fabric, paper, wood and other similar materials to try on. You’ll also be able to choose from many different coloured inks in the studio to print your artwork (although black ink always seems to be a favourite!). Concise yet comprehensive: Shorter sessions accommodate participants who have scheduling constraints or limited time, while still covering the fundamentals. All materials are provided. Essentials yet experimental: Participants are encouraged to grasp the important elements of the silkscreening process, yet encouraged to play and explore in a no-pressure, fun setting. Inspiring art environment: Workshops take place in our gallery/shop/studio. Participants can draw inspiration from the exhibited art works. Our aesthetic is contemporary and graphic, and you’ll come face-to-face with some of the freshest graphic art work by local, Canadian and international artists. You’ll also have access to books and publications on silkscreening available in-house. Small class sizes: Participants are capped at 5 per workshop to accommodate different learning styles and make sure you personally get the technique right. 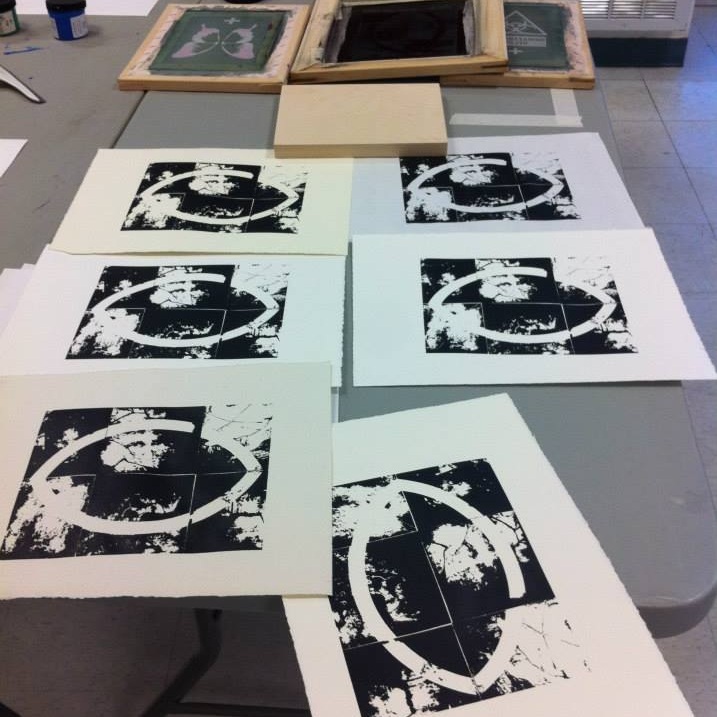 Experienced educator: Workshops are led by Melanie Yugo, Possible Worlds/Spins & Needles Co-Director, with over 10+ years experience and considered the go-to source for silkscreening and art education in Ottawa-Gatineau. Post-workshop setup: Participants will learn how to set up a printing area, adaptable to a home or studio setting in a small or large space. A checklist of materials and where to buy them is also distributed. Silkscreening starter set: Participants can continue to print or practice their technique by taking home their 14 x 16” wood screen with image or blank screen for an additional $30. Professional grade squeegees are avaialble for $10 (taxes are additional). Dates don’t fit your schedule? Or interested in a workshop for your school, group, community or institution? Consider booking a private group workshop or private one-on-one workshop. We accomodate private instruction for individuals who learn better in a one-on-one scenario, or who are unable to participate in our workshops due to scheduling constraints. A popular choice for groups of 4-5 people who want to learn together on a specific date. We’ve hosted workshops for non-profits, community organizations, family members, groups of friends, office colleagues, band members, roommates, wedding parties, holiday parties, teambuilding and book clubs. We are flexible! We can also customize workshops as part of our Mobile Art Studio at your location of choice. Click on the button below to inquire about a workshop. LOOKING FOR OTHER WORKSHOP OPTIONS?